To print this chapter in flat-letter format, click here: Chapter 2 Requires free Adobe Reader. The time it takes for our planet to journey once around the sun in 365.24 days. Admittedly, a number of religious calendars also track the changes of the moon’s phases in order to define the passage of months and fix the dates of religious observations and holidays. Mysteriously, many ancient clocks and calendars dated from before 500 BC measure more than two variables. Why do cultures around the world separated by thousands of miles, and sometimes hundreds of years, develop similar and unique methods of measuring a third variable in the calculation of time? What is this third variable and what does it have to do with Einstein’s Theories of Relativity? To deal with the many misconceptions about how the physical laws of science relate to the Bible, I felt the need to start with a few stories to make you think. I hope it will broaden your perceptions, as a dual track railroad is more balanced as a system. This will make it easier to understand the reasoning behind my spin-axis hypothesis and how it relates to mystery clocks and ancient calendars. An ingrained monorail opinion, whether scientific or religious, needs the other rail to get a balanced worldview. Even Professor Albert Einstein taught the scientific world that time is not what it seems; therefore, the Speed of Light may not be constant either. Both time and the speed of light seem to be differently affected by gravity. Just as the moon’s gravity pulls on the earth’s oceans to make tides, so the gravity of galaxies, stars, planets and other stellar phenomena pull, bend and even consume light and time. That idea is now more to discussion. The primary lesson for modern scientific observation is that the geological dogma of uniformitarianism is only useful within a delimited context of time when viewed from a monorail perspective. We have at best only a couple of hundred years of documented observations. From them most scientists extrapolate “billions of years” opinions forward or backward through time. But Einstein taught us that, when it comes to the passage of time, what we may perceive to be taking place is distorted by our point of reference. Because we are a participating part of the system, we cannot be experientially objective: we cannot observe or measure time objectively. We need a third, external point of reference for that purpose. Understanding the spin-axis hypothesis and three-dial mystery clocks will then reveal that how we measure time today may not have been the way it was done by ancient cultures because their astronomical observations were different from what we can see in the sky today. Clearly, ancient civilizations went to a great deal of expense and effort to measure the passage of time and the seasons. Stargazing and naming the stars, grouping them into Zodiac constellations with a story, is universally one of the oldest sciences found in every technologically advanced human culture. Just look at the numerous ancient pyramids and stone circles built around the world. News reports frequently announce some new discovery of such monumental time-measuring architecture. Thus, figuring out what was happening in the skies was vitally important to the ancients. It consumed their attention and wealth in a way that is incomprehensible given our present stable, easily predictable cycles of seasons. Perhaps the change of seasons was not always so easy to predict? If so, then it is easier to understand why the ancients devoted so much of their resources to calendars: there was a very practical reason for it. To simply attribute religious beliefs as the prime motivators for such projects is insufficient. I propose that the seasons were sequential but much less predictable in there lengths than what we experience on the earth today. I believe that these diverse ancient cultures each were observing phenomena in the skies that differs from what we can see today. Perception is from the location of the observers, and the records of antiquity record those perceptions accurately. Modern scientists have difficulty in explaining what archaeologists and historians uncover because they have limited themselves by their uniformitarian bias: they try to solve these ancient clock and calendar mysteries within the narrow confines of present astronomical observation typical of a mono rail perspective. They do not consider the possibility that the earth has not always moved around the sun exactly as it does today – granted the slight adjustments that the wonderful instruments of modern science have permitted us to measure. My point is that even with the extrapolation of current astronomical variation, the experts cannot explain a number of ancient mysteries, such as the Mayan and Aztec calendars or the Antikythera “clock” and many others. In this short work, I will propose an astounding hypothesis that resolves the mysteries of ancient calendar clocks from around the world! My hypothesis is based on the premise that the earth’s movements around the sun were significantly different before 500 BC basing it on dual track railroad knowledge. Antique clocks indicate a third axis of spin for the earth’s movements in addition to its daily rotation around the poles and its (present) 365.24 day journey (orbit) around the sun. Consequently, the ancients spent a great deal of mental and material resources in trying to figure out and measure the gradual unwinding of this third axis of earth movement over a period of about 1800 years. In other words, what they saw in the skies 3,000 and more years ago was not what we can see today. They accurately recorded what they did see in the monuments, calendars and clocks they created from their astrological observations. Remember, the ancient science of stargazing was an integral, inseparable part of astrology. To help you to grasp the nature of my hypothesis, let me explain one of the great mysteries of science and antiquity: the Aztec Precessions of Equinoxes. How did the Aztecs and Mayans discover the 25,625-year precession, or cycle of the earth’s axis pointing north, from Polaris, Alderabin, Taw, Herculis, Vega and Thubor? That means that it takes 5,125 years for the identity of the “North Star” to move sequentially between each of the five stars in the list. In other words, how could these ancient astronomers observe or calculate the very, very slow and gradual circular movement of the earth’s axis, which is observed as being a changing north star? They did not have our modern telescopes or computers to help them. My hypothesis would explain the above as stating that they did not need our huge and accurate telescopes, nor did they need our modern computers. The ancient American Indians were able to observe this precession visually with the naked eye. In fact at one point the earth movements across the skies was faster going through the whole five star cycles about twice a year. By 3,500 years ago or so, this precession had slowed down exponentially to what we have today. I have it charted later on. Thus, today’s 25,625-year precession is the residual echo of what was once an axial wobble much greater and more mobile to a situation very close to our present, relatively fixed 23.5 degree axis of daily rotation. When I originally became interested in these ancient calendars, I knew that I needed a reliable and external point of perspective in order to understand what was going on in the earth’s ancient skies. I found it in the Bible, which talks about people living hundreds of years long during an age of nearly uniform climate without rain. This age came to a violently end by a Great Flood, which had sprung forth from the earth’s “fountains of the deep.” This is where most of the water came from, but something had to release them. For a number of reasons, I concluded that an asteroid strike was what I see imbedded in geology. I do not believe that uniformitarianism explains all of the earth’s past; however, as a successful technical inventor I do believe in proven science. I also believe in the Bible, but not necessarily as theologians preach about it. I think that the asteroid recorded here may have been the one that science has found a potential asteroid impact at the bottom of the Gulf of Mexico. Many say that it ended the age of dinosaurs, which I would equate to the age before the Flood of Noah. We only differ in the time aspect with plenty of evidence that it was recent collaborated by human eyewitnesses. When this asteroid struck, the ancient single land mass broke up into today’s continents releasing the floodwaters. I write more about this event in later chapters in this book. No one can read the accounts of the pre-Flood world in the Bible without concluding that things were very different from today or that the Bible is just a book of ancient myths. For a number of other reasons, I did not believe the latter option, so I started to address some of the scientific inconsistencies of the Genesis account. One of the first that intrigued me was the long lives of the pre-Flood patriarchs. How could anyone live genetically impossible to over 900 years, even if the environment was pure and the oxygen levels about two times what we have today? This did not make sense. At the same time, I was making some trips to Mexico and learning more about the Aztecs culture and their calendar. Out of this research was born my hypothesis for a third spin axis to the earth examining an Aztec calendar clock. The net result of this third axis was to divide our 365-day solar year into 7 “years” or cycles of 52 days, as measured by the cycle of solstice, equinox, solstice, and equinox like four quadrants. That would mean that the “years” (Hebrew shanot or “cycle of [seasonal] changes”) measured by the pre-Flood peoples as recorded in the Bible (and other ancient chronicles) were only 1/7th the length of our modern, Gregorian-secular, years. Thus, Methuselah did not live 968 of our years but only 138! Now that made genetically speaking more sense. This concept would also explain a major contributing factor to an even climate with no rain. By spinning the earth horizontal (7) seven cycles within on solar orbit of 365 days, the surface of the earth would be evenly heated providing a uniformly moderate climate were snow and ice was unknown and a relative lack of temperature differentiation in the air masses – a major factor in the generation or precipitation. Then I noticed that the ages of the patriarchs after the Flood were much less than the 900 years before but still way beyond today’s expectations. However, as the generations passed the longevity of biblical characters gradually declined. When I plotted them on a graph, I got a curve. This observation led me to believe that there was some universal cause to account for this curve of death ages that was rooted in the pre-Flood world and continued to lesser extant afterwards. That cause was a “year” composed of fewer days than the earth’s solar orbit of 365 days. And yes, the ancient composed calendars that often kept track of both by placing a smaller dial/disk within a larger one on many clocks we see later. Let me give you a couple of analogies to help explain my proposed theory of three spin axes for the earth. We live now in the 21st century and have thousands of museums around the world. Living in an information age, we get exposed to unusual art objects, catalogues, newspaper pictures and I would now suggest keeping an eye to track down an imbedded 3-spin axis phenomena since you now have heard about it. I accidentally discovered unknown clocks in museums around the globe which scientist could not figure out how they work. When friends started to response to my books on the internet announcing the Apocalypse they send along information of unresolved mystery calendar clocks or calculators laying in museums waiting for some one to figure out what it is. Being alerted, I kept on looking for further information and came across a bronze sculpture, which tells visually what I am trying to capture in a spin-axis hypothesis that no scientist has ever postulated. When a new story is expanding, it is like ascending a pyramid each step progressing to a higher level of understanding. At various levels, we stop to catch our breath, and we look around and see an expanded viewpoint that gets bigger as we climb higher. Only when we have arrived on top can we see an ancient building landscape below us in a unifying concept. Yes, it took work to climb, but the effort was worth it. What I write about has never been preached in church nor has it been heard in the halls of universities, so it will take some time to put to together. For some reason, God appointed me to be like a Jonah who announces the Hebrew clock cycles of a future Apocalypse 2008-2015, which is now published as two books on the Internet and also found in some bookstores. This third effort looks like an extension of this discovery with five more unknown mystery clocks, which can only be explained by my proposed spin-axis hypothesis. I hope that some scientists will help as I cannot find anything in scientific literature about it, nor do I have the time or education to validate it. I leave it up to you who may be more educated. I am like the farmer in Germany who discovered an ancient bronze gold plated disk and left it up for the experts to fight over. You can read my opinion about this new discovery on the same web site. Perhaps it, too, will inspire a flurry of investigation and persuade some to agree with the Bible. To explain my proposed three-axis hypothesis in a way that the average person can relate to it is not easy. It is a big undertaking for me, as I am not gifted to write even in my own native German language. When we add five more mystery clocks found in various museums, the challenge grows greater. By looking to the Bible to solve these mysteries, I expect that most scientists will automatically reject my thoughtful proposals. Coming home from a recent trip to a pile of junk mail, I found an expensive looking magazine with an art object made of brass advertised for sale in it, so I bought it. This sculpture is pictured at the beginning of this chapter. It does a fair job of visualizing my hypothesis. If you are connected to a university with access to computer models that would help, but being retired I am looking for cheaper ways to explain my ideas. You will notice that there is a large circle within three thicker circles around a ball in the center, which represents our globe with an arrow through it pointing north like a tilted axis. It is obvious to me that the whole encompassing circular structure within a circle represents a 360-degree circumference of a system. The arrow-pointing north represents the now existing 23-½ degree Y-tilt axis. Then there are three circular bands representing orbits, right plus one left at an angle and one in the middle. These could indicate satellite positions, but in my use of it to illustrate my thought, they represent an axis wobble arrangement, which you will soon become familiar with. If the present earth tilt would wobble on a spin-axis then the angle would be twice the present 23½ degrees or 47º. Incidentally, this would be similar to the mean average angle of 47 degrees converging at the top of ancient Egyptian pyramids. So this art presentation is connecting with imbedded pyramid knowledge and could fit the same time frame as one of the last five unfinished pyramids found at the center of Mexico City’s outdoor museum. I date this pyramid to around Moses’ time at 1406 BC. Looking at my sculpture, a thought comes to me that in our modern time, no one ever told me of a tilt axis theory but the collective knowledge of common folk hidden among us sometimes breaks out here and there in art. What I call folk-art-knowledge behaves like an invisible, recessive gene we may not know about. For example, a mother sometimes wonders when a baby is born in a family with red hair. Immediately a search is made in the past family tree with the mother to find somebody who had red hair, too. As I became alerted to a 3-spin axis not supported yet by science, my consternation resulted in finding increasingly more evidence to support my basic research conclusions. Some of them are admittedly extraordinary. Then I learned about five ancient bronze clocks or calculators, which will end in a story that brings together ancient history through my interpretation of palace pictures near the temple buildings in Mexico City. The story concludes with the reason of why those five pyramids in the center of Mexico City were built on top of each other. Talking about an ancient spin-axis of our earth, a question is immediately asked, “What caused our earth axis to rest at today’s angle of 23½ degrees? Was it always at that angle? Could the huge mass of our earth ever be disturbed enough by an asteroid to shift our present axis of spin? We are surrounded in space with many geological evidences of asteroid strikes. Some are even found in the records of early civilizations. To understand what happens when a mass like the earth’s is disturbed, let’s make a little experiment with a glass of water with crushed ice. Place the glass on the table and hold it with your thumb and the middle finger. Then give the glass a rapid twist as much as your finger can turn the glass very quickly. Notice that the crashed ice sits undisturbed for about two or three seconds like nothing happened, but then it will turn the same amount you twisted the glass. The energy of the impact takes time to be transferred to the inner mass as witnessed by the delayed motion reaction. While the glass in your hands is not moving, now only the ice will move. This movement is a delayed internal body velocity until all the energy is dissipated. Looking at a spin-axis theory next, you will see later an exponential calendar curve tying in with the five mystery bronze clocks, which will be better understood if you remember this illustration. Using concepts like this, I discovered how the Aztec calendar clock works. I will illustrate it with a simple model, which is fun to think about because it will open up many scientific and biblical puzzles. Now let me give you an illustration of the dynamics how the earth used to spin on its three axes before the asteroid recorded in Genesis hit our globe and caused a flood in Noah’s time (2288 BC). It will show how my hypothesis explains the Aztec calendar. This all came about when I discovered how the Aztec clock works with its strange cycles. Going through museums in Mexico City and observing a foreign culture, I began to connect it with my recent books and reading some science journals alerted me to a new concept I had not read about. To understand the earth would move using three axes of spin, we can use a small bicycle’s front wheel to represent our earth or with a paper-plastic globe that can spin at its poles. Hold the wheel axis horizontally, level in both hands, and let the wheel spin. Now rotate around to the left on your own axis making a full turn with your spinning wheel. Your one complete turn of your body represents one Aztec year: this completed turn of your body is my proposed unknown X-axis. Notice something else happens that at each 90 degree position by your turning body follows a familiar pattern of a solstice or an equinox cycles we will understand later. So far, we have demonstrated one Aztec year as it was counted before the Flood in 2288 BC. To indicate the Z-axis, we turn our body seven times and at the same time walk around the room in a full grand cycle of 360 degrees. Walking around the room coincides with the earth going one time around the sun (365 days). My discovery is that our bicycle wheel turns 7 times on an X-axis for each Z-axis journey around the sun. This model aligns perfectly with the Aztec calendar to indicate a year of 365+/- days with 7 winter solstices, of which one was a grand solstice corresponding to today’s 21 December of our Gregorian calendar. To sum up this strange X-axis analogy, you walk in a grand circle (Z-axis) and turn around seven times (X-axis) while holding your wheel spinning at an angle (Y-axis). I will explain it again a little slower. To understand how the Aztec clock system works, I will describe what happens in each quadrant as we walk our big circle (axis Z) around the “sun.” Imagine that you are standing in the middle of a parking lot near a lamp when it is dark. The lamp represents the sun. You are facing the lamp and holding the horizontally spinning bicycle wheel in front of you. The axle turning in your right hand represents the North Pole, and the one in your left hand is the South Pole. In this position, your bicycle wheel (earth) gets the full light of the lamp broadside along the spinning wheel’s tire tread or equator. The parts of the wheel being held in your right or left hands (the Polar Regions of the earth) receive very little light from the lamp. We call this position the First Quadrant and it becomes the first equinox. An equinox always gives the equator the maximum exposure to the sun’s rays. In this model, your wheel is rotating in the direction toward the lamp or sun. Turn your body left 90 degrees. Now your right side faces the parking lot lamp as you continue to hold the spinning bicycle wheel in your hands. 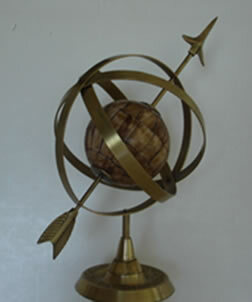 You will notice that now your right hand axle, representing the North Pole of the rotating earth, faces the lamp. This solstice position is called the Second or winter Quadrant. To be able to count annual cycles by the solstice accurately, the observer must have an observation platform marked where the sun reaches its furthest point of progress. At this point, the pole experiences its most direct exposure to the sun. Ancient pyramids and temples were constructed as observation platforms for these purposes. You can see their remains today in Mexico and in other places around the world. Make one more quarter turn to the left. Your back is now to the lamp, and you look away from the light. For our purposes, you will consider your body transparent, thus the full light of the lamp will once again shine broadside along the bicycle wheel tread. This equinox differs from the first in that your wheel now turns away from the lamp (sun). Stretch your imagination a bit. If you were a person living on this bicycle wheel earth, the sun would seem to go in the opposite direction across the sky from what you saw during the first summer equinox. Applying this model to our lives on earth today, it would mean that the sun would sometimes rise in the West and set in the East, and then return to rise in the East and set in the West. When I took a summer cruise into the northern regions of Norway, I noticed that the sun did not go down in the West but hovered above the horizon all night. It did not sink beneath the ocean’s horizon. Then, after so many hours, the sun rose again for another day in a way that made it seem like it had reversed its direction of motion as viewed from the moving ship. I thought about this experience during times of the summer equinox in Norway, the days of the “midnight sun,” when I reflected on how the Aztec calendar worked. The sun used to move forward for 26 days and then backward for 26 days as centered on each solstice. Now turn 90 degrees left again with your spinning wheel. Notice that your left arm now receives the full lamplight or sunlight. Now the South Pole receives its maximum exposure, a full blast of sunlight for the Summer Quadrant of an Aztec year, as reckoned from the solstice Southern Hemisphere. Your full-circle walk around the lamppost represents the Z-axis of 365+/- days. As you walked the big circle of the Z-axis, you also turned your body around seven times imitating the X-axis. Each full turn of the X-axis was counted as 1 “year” (Hebrew, shanah) in calendars used before the Flood. There were 7 spins of the X-axis in one turn of the Z-axis. The Mesoamerican- Mayan- Aztec calendars “remember” these X-axis years in its structure of 7 cycles of 52 days. After the Flood, the X-axis gradually disappeared: it resolved in wobbling from the asteroid strike by merging into the Y-axis. The bicycle wheel turned 13 times (days) four times each quarter turn or quadrant (which is the Y-axis) and turned seven times the other way to illustrate the X-axis. Each 13-day quadrant would have seemed more like the month to us because of its short length. Even more astounding is that each of these 13-day months is an astronomical season by definition because it begins with an equinox and ends with a solstice, or vice versa. Imagine you are on earth before 2288 BC. Looking at the sun, you will notice that in the First Quadrant the sun rises in the east and sets in the west 13 Y-axis days until we reach the summer equinox for this X-axis spin. As we pass the equinox, the days still become longer. Not like today when days get shorter. This X-axis summer position will keep the days getting longer until the half “year” of Aztec 26 days has arrived at the southern solstice position. At the point of the southern solstice, the sun will seemingly reverse its motion to rise in the west and set in the east for the next 26 days until it arrives at the northern solstice position where the daylight portion of a Y-axis spin has the shortest duration. In other words, when it arrives at the point of the southern solstice, the sun’s movement will seem to rise in the west and set in the east for 26 Y-axis days and then repeat the cycle. If you are wondering why the earth made these 7 X-axis cycles in the course of a year, then you are in the same boat I am. Perhaps the earth and the moon originally orbited around each other like a binary planet. The moon’s mass may be big enough, and astronomers know that its orbit could not have been the same as it is today. When you use a computer to reverse time, the moon merges with the earth’s surface theoretical about 2 billion years ago. Even given the questions about absolute chronologies of this length, this does not make sense because the earth and the moon are both believed by some scientist to be 4.5 billion years old. When we talk about billions years, to me it is pure speculation and makes no common sense scientifically. Recent scientific measurement of the sun’s diameter shows that it loses a bit of girth each year as its burns off energy. If we postulate billions years multiplied with that yearly sun reduction we measure today, we get a sun so big, that it would eat up our earth long time ago and life would not be possible. Consequently, conjecture about long ages of our earth is pure fantasy comparing it with life as we know it on earth. Seeing that only shorter creation cycles makes more sense and that is what I see imbedded in geology and eyewitness tell me about in the Bible which is an ancient history book only ignorant people believing in unscientific outmoded evolution opinions reject it. If the earth and the moon orbited around some common center even as they orbited around each other, this could possibly explain my X-axis. Here is where I need an astrophysicist and his computer models to test out my thinking. Meanwhile, consider that the asteroid strike starting the Flood could have affected the moon, too. Perhaps some fragments as they always come in pairs could have struck the moon too which shows the evidence with our bare eyes during a full moon cycle. Somehow, when it had all settle down, the moon could have launched into its present slow escape from the earth’s gravity. The moon’s gravitational shift in such an event would have influence and contributed to the massive changes in the earth’s surface described elsewhere. When I write about correlations with the Bible that also connect with science, then I am using a balanced worldview of a dual track railroad system. We can be either a narrow-minded monorail theologian or scientist. Today it seems that man’s knowledge is expanding exponentially at an ever faster pace without limits. But it will stop. Guaranteed. Now you have been exposed to a little fun with a bicycle wheel as you walked around a streetlight in a parking lot. I hope no one was around and called the police. If you really tried it, I do not doubt that it may have created some negative emotions within typical of monorail specialists. But for me discovering new things is always exiting and I like to share it without asking for benefit. The thoughts I expressed in writing two years ago were made without knowing anything about the five (5) mystery clocks I write about in this book. Together, these discoveries have convinced me that the Bible is totally scientific. In closing this opening chapter, I want to summarize what all unidentified mystery clocks have in common. If you are a computer-nerd, it would be fun to generate a three-axis computer program and let it go from 2288 BC until one axis merges with the present axis nearly stopped at 23½ degrees at about 518 BC and fully resting at that angle at the transition from BC to AD. When science postulates a wrong assumption it can never lead into right conclusion. In my report, I will question many science theories religiously believed without any proof. Wrong scientific evaluations can be observed and rechecked in the test tube and popular theories can be found later to be in error. If a wrong theory becomes the basis for other theories, it becomes like a house built on the foundation of a wrong assumption. It could all collapse without warning. It is just a matter of time until a different wind blows and knocks it down. For example, Dr. Albert Einstein came along and pointed out the discrepancies in the speed of light that indicated a number of wrong assumptions. He was careful not to offend the establishment and only went half way. I do not have that problem as I am not famous with any reputation to protect, but nevertheless I confront strange concepts and try to apply logic to disprove them. So test my ideas fairly. For now, lay aside what I feel are wrong science assumptions and journey with me to decipher mystery clocks. If I am shot down before making my argument, then the clocks will remain mystery. The erroneous scientific biases will never decode them. Let’s cover some cause-and-effect stories to highlight where science has gone in the wrong direction. This will help you to better understand my spin-axis hypothesis. The X-Y spin-axis hypothesis has many ramifications but no other reference books. Most people do not understand the theories of relativity, and when we speak of ancient mystery clocks or calculators measuring time then even the definition of time is even more difficult to grasp. We always expect that our clock would tell us 24 hours a day and cannot imagine that it could have been different in ancient times. To stretch our imaginations a bit, remember that our units of time come from the travel of our earth around the sun. To grasp philosophically that time could have been different at the dawn of civilization, modern science asked Dr. Einstein to express “time” quantitatively and explain the universe with mathematics. Eventually we can expand on his line of thinking and apply it to our lives and perhaps understand a new spin-axis theory from a different viewpoint. We heard of relative truth and absolute truth and delineate between what appears to be within physical laws used by scientists to categorize the phenomena of this world. Even so, sometimes they go outside conventional scientific methods. There exists another dimension interacting with our everyday consciousness, which belongs to the area of indirect perception like measuring the effects of relativity, time, and space that Dr. Einstein and Sir Isaac Newton wanted to define. Besides physical laws, the spiritual realm of the Bible deals with the metaphysical, like morals, ethics, love, eternal life and ultimately God the Creator. Spiritual laws conform to physical laws like the two rails of a balanced railroad track. To deny the existence of one rail would eliminate half of the books ever written around the world. Many of my hi-tech inventions came about by intuition, but defining how it works belongs to the realm of perception. Scientists still failing to understand the beginnings of life and where we come from will have difficulty comprehending my spin-axis story. Writing such a story is easier for common people, but those deeply educated in questionable theories do not take a very logical or balanced approach to understanding the unknown that cannot be directly observed or tested. It is an uphill battle for me, and it takes a little more time. To communicate concepts against the background of fairytales dressed up in scientific cloth with convoluted uniformly long age theories that mutually support each other though never proven. The problem is if the first assumption or hypothesis is wrong, then all the others will be, too. Wrong theories collapse like a house of cards if the foundational assumption is faulty. For example, science believes in the evolution of species requiring long ages, but the fact remains we can only document extinction in the fossil records and that points to a creation model and not the other way. I just do not see even one cross species’ fossilized bones in the thousands of extinctions uncovered. Not surprising, this data conforms to the Second Law of Thermodynamics. Then there is the recent work in documenting the extremely complex and barely understood genetics project. An unbiased evaluation of these scientific advances puts a lot of fear into the university establishment who may yet be shown to be utterly incompetent due to their monorail blindness. Deciphering mystery clocks connected with a third spin-axis for the earth presents big problems for traditional evolutionists. Many scientists function as priests in an atheistic religion called public education. It is label secular truth, but it is functionally a mystery religion preached in our “secular” universities. A freethinking scientist who understands the laws of entropy knows that evolution is impossible. The First Law of thermodynamics states that you can never generate, obtain or observe an energy conversion over 100%. A one-celled worm has imbedded within it the coded intelligence to replicate itself as it is. Even given billions of years, it can never become a frog kissed by a beautiful prince and further develop into a monkey. Billions of cells cannot transform themselves into a more complex intelligence code. Similarly, a laptop computer is not designed to compete with an IBM supercomputer. Even putting a thousand laptops in top of each other will not replicate the function of a supercomputer unless you make it into a religion. The Second Law demonstrates devolution as energy degrades or seeps from a higher level to lower levels of energy. It never occurs in the other direction, and that is the reason I am getting older and my body shrivels. We find plenty of proof that the laws work by looking at the geological history embedded in our earth. I only see thousands of extinctions and never any trans-specie examples going higher up the evolution scale. That is why you only see artists’ paintings on museum walls and not photos of complete skeletons demonstrating the millions of micro-changes that would need to take place for evolution to be proven from fossils. Artists draw imaginary creatures ending in man next to small bits of extinct skeletons that you can touch to be convinced. However, different artists invariably come up with different pictures based on the sketchy remains they have to work with. Fossilized human footprints are found in Texas that are unmistakably imprinted in former muck changed into stone with those of dinosaurs. Most museums will not permit them to be exhibited and will not even permit photographs to be displayed so as to educate our children with facts in conflict with a children frog-prince fairytale story. I am glad that somehow the sequence of the evolution theory still follows the Biblical creation narration starting with small seeds of vegetation to end in man rather teaching along the entropy model, which is more possible – that is, humanity’s devolution to monkeys and then down to the one cell. I previously mentioned that the inconsistencies of science as popularly preached to make you think a little, but I have written enough on that, so let’s get back to the story. To understand an X-Y axis phenomenon we must dabble a little in theory of relativity. Set aside your preset opinions temporarily and consider that hidden truth could exist on the other side of time’s limitations. The Big Bang Theory was invented in 1930. It states that the universe was created by a big explosion billions of years ago. The thought that billions of years is required conflicts with the Second Law of Thermodynamics. Science has recently demonstrated that the speed of light is not constant, which will raise most eyebrows in our universities. Some science magazine articles have demonstrated that light is slowing down over the passage of time, which is in conformity to the Second Law of Thermodynamics that allows no exceptions. Scientists collected all of the measurements made of the speed of light from the last 400 years and programmed it in a computer for analysis. Surprisingly, the computer spit out an exponential down hill curve of a slowing speed instead of the expected linear straight line for a constant speed of light. Analyzing the data, they had to conclude that light has been slowing down or throw out thousands measurements as questionable. This discovery agrees with Dr. Albert Einstein’s theories of relativity, which postulated that light is bent by gravity and therefore must slow down. Astronomers have confirmed this point, so Einstein’s rationally developed theory using indirect evidence has been upheld again by scientific work completed decades after his death. To decipher ancient mystery clocks that do not match our present cycles of time keeping requires us to stretch our minds a little more. This includes accepting for the moment some basic philosophical reference points and religious records like the Bible. How these various old documents balance out to the same spin-axis conclusion will make logical sense if you just give it a test ride. The Bible is the oldest book on earth and was inspired with what I call extraterrestrial information. It connects with your spirit within that I call the sixth sense, which cannot be defined by purely physical laws. Unfortunately, modern education immediately rejects any idea that cannot be explained with accepted conventional theories. It is hostile to religious traditions and remains scientifically ignorant because it rejects these ancient eyewitness testimonies out of hand. To make a clock that keeps accurate time, a clockmaker, such as myself, must calculate gear ratios for many gears before machining the parts. First, a theoretically design must be established, which can be calculated and checked out against a concept. After I have fabricated the parts and all is assembled, I test the clock’s accuracy to see if it performs according to design. If it is consistently late 15 minutes, then I am upset and try to adjust it. If the adjustment features do not do the trick, then I conclude that my blueprint is screwed up, and I reject that design. I use mathematics to analyze the failed design, make corrections to the calculations and then try again. God’s plan for humanity in the Bible has embedded many design features with cycles similar to clock gears that can be checked out against conventional science. Any biblical chronology or calendar system can be verified with mathematics and logical principles. If we discover some hidden spectral lines in the seven rainbow colors or learn that light is not constant, then it is foolish to simply dismiss a disturbing discovery. We should just check it out further even if it is in conflict with a pet theory taught in the highest university level. The red shift principle hypothesizes an expansion of the universe brought about by the Big Bang. It states that light from an object that shifts to the red side of the spectrum is moving away. I believe that the opposite of that theory is true. A red shift tells me that light is slowing down rather than moving away. It is a matter of perception - the window you choose to look through in a moving California coastal train. In contrast, the monorail perspective of today’s universities preaches a different gospel: there is no end and the origin of the universe and our earth took place billions of years ago. The spin-axis hypothesis uses much, much smaller time cycles to coincide with human existence on earth as recorded in the Hebrew Bible’s chronological system of about 7,000 years. This shorter time frame is verified by putting human genetic reproduction cycles backwards in a computer to reverse population growth to a time of beginning – about 8,000 years! This figure was calculated by scientists, which is pretty close to the biblical period for Adam and Eve, the first couple. I found a date of creation 4488 BC in the Aztec calendar that I converted to our Gregorian calendar, which is about 7,500 years ago. This also verifies a biblical date for the creation stories. How did the Aztecs come up with such a date? Keep reading, and I will give you the answer to that question, and it is no fairy tale story of a frog kissed by a maiden to become a prince! Geology confirms short creation cycles as long ages cannot be proven with a false carbon dating method that is no longer working since 1948 as the entire earth has become permanently contaminated with nuclear fallout. Later on when we understand the spin-axis idea a little better, it will logically fit together. In fact, I have plotted the time changes in an exponential diagram that I developed. For now, the graph brings the ancient variables to an apparent rest appropriate to a historical time frame of 7,000 years. I then transpose the exponential curves to a linear calendar of clock cycles to make it easier to understand. The recorded Aztec observations of a specific astronomical precession is the key to understanding what happened, but it must be cross-referenced with the other rail of the Hebrew thinking. Only then can we solve the mysteries communicated by the design of these fabulous ancient clocks sitting in museums around the world waiting to be deciphered. A number of space scientists and physicists recently conclude that the universe could be mostly composed of dark matter and therefore invisible. This idea started out with a red shift caused by the Big Bang but further theories open ended expanding the model to make it fit. It was then extended to include black holes but that just made dark matter and energy more difficult to understand. Previously, many galaxies were measured with reflected visible light are now checked out with infrared and higher frequency filters on specialized instruments in satellites that are giving us new discoveries. Interpreting those images brings me right back to my belief in a Creator. A friend recently told me that he was an atheist. I tried to explain that language has underlying meanings. For example, when we say “dark” energy, we think of contrasting “light” because that is what we experience. If everybody were blind, then light would have no meaning. Likewise, our minds and consciousness work on two planes. If you contrast God with a mortal, then you get pairs of words: infinite-finite, light-darkness, good-evil and life-death. Therefore, for someone to be an atheist, then the root meaning of the word declares the existence of God as a prerequisite, or such a word would not exist. Words used daily cannot always be proven in their essence in the laboratory, but we define them by experiencing their meanings. Our experience makes them real. Let me illustrate with a story. Imagine a person going on a weekend camping trip with the kids in the woods. The father gets out of the car to scout around for a good place to bed down and makes a circle around some woody bushes. All in the sudden he falls into a 20-foot deep pit that is pitch dark. Getting up from his fall, he realized that no bones are broken and wondered what the ... am I. No answer came to his loud screams for help – not even an echo or any other noise. He reached his arms out as he walked forward in the pitch darkness. He was conscientious only of an impenetrable dark emptiness that seems to be ahead. He tried to find something he could touch and relate to. Dark thoughts came to mind as he remembered Jesus’ teaching about an “outer darkness” and wondered if he was in Hell. Then his hands touched something. Shaking hands examined what seemed to be a wall. His heart raced a little faster as he examined it inch-by-inch, feeling for an exit. Hours and hours past, and he worried about his wife and kids. He desperately wanted to find a light switch. Eventually he came to realize that there was “no exit.” His hope collapsed in despair. This story pictures humanity in the last century. A civilization that made tremendous strides in technology and tried to establish a just government for the masses through revolution, wars and ethnic cleansings only to confess there is no “Exit” door for humanity. Today, optimism is out as our universities reject any notion dealing with the spiritual side of man. Being 76 years old after growing up under Hitler in Germany, I have heard so many propaganda promises promoted by tons of books written to embellished Karl Marx, Engels, Voltaire and others. All were tried and failed. That long list includes socialism, nationalism, bolshevism, fundamentalism, conservatism, rightist and leftist, democrat, republican, etc. Millions and millions were killed in the last century by a godless system. There is no end in sight. If you look at business, economics, or global politics – they all seem to be off the hinges like a boat lost in the storm. Around the world, nations and governments are perplexed, unable to stem the tide. All desperately deny the obvious as they have now become Gods themselves without an “exit” and without a compass for direction. If the eternal God does not exist, then you must be God. Let’s find out were the world is going. Before I discuss the spin-axis hypothesis, one more story would not hurt to let you know how we can measure the pulse of our American society. Consider whether we have a healthy dispossession to learn new technology in the future. Rejecting the Bible as unscientific out of hand only demonstrates uneducated ignorance. It is a behavior no different from when Galileo was threatened by a controlling religious priesthood uncertain about what to do with unusual discoveries. Today, a prevailing atheistic priesthood manipulates our universities and wants to control the mindset of humanity just like the Catholic Church did in the 15 th century. For example, high school graduation ceremonies do not permit a student to mention a historic person, Jesus Christ, during an address to the student body and families assembled. Each year several brilliant students run the risk of jail sentences because they do not cave in to the threats from public school administrators who deny the students’ constitutionally guaranteed freedom of speech. One student suffered the loss of the public address system, which was turned off in the middle of her speech. Even though family and friends were present, school officials chose to behave as Gestapo terrorists violating basic American freedoms. Not much has changed since Galileo’s time, though history proves that oppressive power will not prevail. It is shameful when a teacher is unwilling to learn from the students. Schools should encourage responsible free speech, or we will never stem the growing worldwide tide of tyrannical dictatorships. Instead, public schools teach oppression by their example of denying basic human rights to students. Why are school professors so afraid to hear a young person’s opinion? We should have learned by now that religious intolerance breeds persecution. The unconstitutional denial of students’ freedom of speech, when it comes to Jesus Christ and the Bible, proves that intolerant, so-called “secular” education is very religious at heart and not objective. Now let’s have a look at the Infinite Time chart, which attempts to define “time” a little differently from what you may have ever seen before. I constructed it this way to analyze what the mystery clocks and calendars were measuring. This chart provides important context to the spin-axis hypothesis. I use the expression “time” in comparison with the 7,000-year history cycles of humanity. I had noticed that the monthly progression of cycles or years of ancient calendars behave as if they possess relative values compared to the absolute and fixed system of the modern Gregorian calendar. This observation is very important as it demonstrates the possibility for a different monthly count within a year of the earth’s orbit of the sun during the ages of earliest human history. The Bible states that Jesus appeared at the fullness of time; therefore we measure our Gregorian calendars on either side of his birth, which is where the BC/AD line is drawn. It is the apex of human existence from a Christian biblical perspective. The chart itself displays a set of logarithmic parabolic curves. It begins at an infinite left side and curves to an infinite future on the right. The apex of the parabola touches a horizontal line at BC/AD. Afterwards, two options open up. One may travel into infinite along the line of Eternal Life into the Jod Dimension, or one can travel the downward curve to the White Throne Judgment ending material time and space that the Hebrew Alphabet Number System (HANS) identifies as the Daleth Dimension, which end is symbolized with Taw, the last letter of the Hebrew alphabet. As a clockmaker, I attempted to straighten out this exponential curve along a horizontal line to better depict the passage of human history from the BC to AD perspective. This special crossover point in time measures or divides our calendar with Jesus Christ. He is the fulcrum of our existence connecting us with the past infinite time to an infinite future time. If you are interested in “God’s plan for humanity” from another perspective never preached in church or just curious about a new Biblical Rosetta Stone discovery, check out my book on the Internet. You can read it for free there. It may yet surprise some that the Bible is imbedded with a Hebrew Alphabet Number System. From it, future dates of Bible prophecy may be calculated from the Torah and Jewish holidays cycles explained in a second book also free on the Internet. My recent development of this spin-axis hypothesis could be considered a sequel to those two books. I recommend that you become familiar with the Hebrew Alphabet Number System if you are a serious about not fitting into the traditional religious mold. I need to comment why it is proper to measure BC/AD from the current dividing point in the historical timeline. I believe God invented it as YHWH or Jehovah (Jesus in Greek) is the fulcrum of our time existence, but that is not enough to persuade me. I needed some science to prove it. Historians measure our time as starting in AD 525 as no one before that time assumed and knew it was 525. Why? Once there was a monk named Dionysus Exiguous who lived in a part of the world called Scythia, which is just north of the Black Sea in Asia. This monk made a pilgrimage to Rome the center of the western civilization. In his day, all roads literally ended in Rome. There he witnessed many pagan festivals still being celebrated such as the solstice related 25 December, which represents the sun god reborn. He got upset and subsequently proposed changing these pagan festivals into Christian ones, hence the birth of Christmas. All the previous Roman pagan customs, dates and symbols remained in place not to create a stir, but he called it the birthday of the Lord. That cleverly camouflaged the switch from the observance of the despicable Jewish Holidays rightly associated with Jesus’ life. The Jews were hated and persecuted so eliminating Jewish holidays was welcomed by the Popes. The Pope permitted people to keep their pagan holiday Solstice Day in the winter time with a green tree and candles to honor their sun-god as others can celebrate Christmas and making it in the year of our Lord the 525 th birthday. Year in Latin means “anno,” and “our Lord” means domino. That became a worldwide contribution to our measuring time. But since that time many scholars disputed his dating method and today I am confronted with zero, 2 BC, 4 BC and 6 BC and more for the birth year of Jesus. Who is right? If we ask Hebrew scholars for the year that the Solomon Temple was destroyed by the Babylonians, we would probably hear 586 BC. However, my calendar created from the Hebrew Alphabet Number system dates it to 588 BC. We differ by two years, which means that my 7,000-year clock cycles are either wrong and my books in error to announce a future date for the apocalypse of 21 December 2008 – 21 December 2012 – 21 December 2015. Whom should we trust? Time will tell in just a few years. Science should not rest on opinion or reputation of the researcher. It should be determined by the facts and methods used to determine those facts, so I make my story longer than it needs to be to simply tell you what happened, when. In the meantime, I point to a scientific clock system to arbitrate between scholars. Gears must mesh, as we cannot have half a tooth in the system. They either mesh, or the clock is worthless. No opinion of anyone will change or massage the outcome. The Hebrew Alphabet Number System (HANS) is really an independent reference check. It points out aberrations, slight missing on the edges and even reorganized Revelation in the Bible as the chronological order is mixed up. Re-ordering Revelation upsets theologians because it points out false doctrines preached in church. Like Solomon ordered to divide a baby to determine the real mother, HANS will point out the truth. The monk Dionysus Exiguous was right in his dating according to HANS - Zero BC/AD is correct! If you study the 7,000-Year Table in the Appendix, you will notice that all calendar Hebrew dates end with a number 8. In Hebrew, that number eight has the meaning of a confined fenced-in place or a new cycle starting. It is therefore a double check if you want to date anything in history. It has imbedded the dual message of the material Daleth dimension and spiritual Heh dimension depending in which direction you look. Cycles operate in either a past or a future direction, depending on your perspective. Go back to my California coastal train analogy, if you look out one window you see unending oceans, while the windows on the other side of the train have a view of mountains and cities. In a moving train, one could have a different perspective depending on the seating, so the measurement of time depends on observations but must also conform to a train schedule of the system. Knowing a little about that train’s schedule will change your expectations and correlation of what you see to the whole of history. We are learning about mystery clocks and need to look at the total time divided in our latest version of a Gregorian calendar. We need to agree among ourselves to accept the facts presented in order to explore their significance. The Aztec method of crossing over at seven times with a two-hand clock system ending on a number 8 is found in the calendar cycles of ancient Mesoamerica and China, which will be explained elsewhere in my book. In this system of measuring time, the crossover of the two hands was the important event and not the number on the dial. This is how I discovered the spin-axis. Look at your kitchen clock. Notice that the first crossover is about one’ clock as the small hand moves. It takes seven crossovers or seven Aztec spins to reach 8 on the dial. (7+1=8) Looking at the incremental 490-year long Hebrew cycles and various other gear sizes embedded in this astronomical world clock, it became obvious that all given date cycles must mesh within an assumed 24 hours to a day across 7,000 years of Hebrew calendar cycles. Notice again that most major dates in the 7,000-year table end with the number (8) eight. Our week has 7 days and the seven is divinely built into our system of measuring time. The biblical Rosetta stone is a 7:5 ratio (or 12) imbedded in many time measurements. There are 12 hours on one clock dial, 12 months in a year, 12 disciples, and 12 tribes of Israel, 12 zodiac constellations and more. Understanding the importance of 8 in clock cycles is only a check in mathematics because the real unit of importance was the prime number 7. The 7 of an ancient spin-axis is buried in the system we will soon understand. So the 7,000-year calendar and cycles with major dates ending in 8 only verifies the calculated dynamics of a calendar based on 7s. HANS mathematics is essential to understand if one is to analyze these ancient calendars that conform to prime numbers. The math is very difficult using different methods of accounting. I got a lot of fractions over long periods of time. To hit any date within a day and conform to the prime numbers 5, 7, 13, 483, as the ancient clocks did, is a miracle. I believe my discoveries must be divinely inspired, as the chances of such consistent accuracy are very remote. We usually only think of time incrementally like a train stopping at railroad stations, or when we look out the window of a moving train, we see telephone poles passing by. Sometimes we measure time in hours at other times in miles or light years. Looking out the window from an airplane at 35,000 feet and seeing another airplane fly by, I wondered how fast that time period I viewed really was expressed in miles. To get relative truth converted into absolute truth requires an inquiry with the pilot of both airplanes. Consequently, converting relative to absolute truth requires the other rail of extraterrestrial information not accepted by most scientists. Understanding history from a mystery clock’s perspective requires us to consider information outside our daily journey. If science does not have the answer, I look to extraterrestrial information and regularly find it in the Bible. That information is as reliable as many events can be proven with science. As an inventor of many commercial products, I could testify to it but a skeptical scientist always needs more proof. Getting that proof is complicated by his ingrained biases from unproven theories that cloud his thinking. My assurance as a successful inventor comes from looking at hundreds of prophecies in the Bible that were written thousands years ago and yet happened on time in the course of God’s plan for humanity. When seriously checked out of its possibility, I have no trouble to accept biblical information as facts against the background of secular history. I found reliable factual data, which I can acknowledge as true to me, hence led my perception as a scientist to agree with prophecy as absolute true. Although I may not understand the mechanism, I do not immediately reject it. For example, I do not yet understand how light bends time as expressed in parabolic exponential curves. In reviewing other cultures around the globe, I find evidence in history that the ancient used different calendar counting methods. Our calendar is so easy, so why do we find the ancient Aztec with a calendar of 260 days? Why do others like the Chinese, Hebrew, Islamic, Western calendars, all attempt to measure time through various unknown practices? We know something about how the Babylonians originally counted 360 days per year. Their systems were taken over by the Persians, followed by Greeks and Romans. We will later explain a Persian clock that evidences a transition of calendar counting methods with a flexible X-Y spin-axis. Again, we have a perceived measuring of time by ancient calculators not deciphered. It is time to create a model of an absolute calendar to advance a better understanding of dating the antiquity. The X-Y spin-axis hypothesis could be the mediator to bring it all together. I discovered that BC/AD is truly the center of history for our human race. It agrees with the biblical Rosetta Stone ratio in Daniels prophesy, and it shows up in the mystery clocks. My previous research revealed 7,000 clock cycles for humanity. Thinking linearly, we measure our calendar division along the lines of years, months and hours backwards and write before Christ so many years. Aztec records describe constellation movements in 52,000-year cycles, and our scientists talk about precessions of the equinoxes of 5,625 years, which is just another viewpoint of the same thing. The Hebrew calendar divides time into 490 cycles, which seems to fit historical cycles how two civilizations developed. When I recalculated it in Gregorian year’s time frame they all matched exactly to within a narrow target of 24 hours of solstice and equinox days. I use the analogy that gears must mesh within a clock to be useful. If we make historical projection to test a theory, we cannot have half a tooth in a clock calendar system. That is why Biblical prophecy convinced me to be absolute truth using mathematics. I briefly mentioning it, but I come to conclude that time was measured differently in ancient cultures. An asteroid colliding with earth changed the rhythms of our globe and humanity wanted to figure it out ever since. Huge pyramids were built everywhere around the world at a bout the same point in history. They were followed by elaborate clocks invented to mark time in a manner that makes no sense to us today until it finally settled down with a clock dial of 12 hours. So looking back in time in increments of years we are stopped about 2288 BC and nobody seems to have an eyewitness record from that time except the Bible. It is like the Atlantis civilization disappeared with all the records of humanity. Many theories abound. Many ancient cultures tell of great crises in antiquity. When I spliced it together with biblical records, a new, 4,000-year old picture emerged indicating the reason why. Let me express a few ideas I discovered examining ancient calendar cycles and hopeful we can bring it together to understand it in our time frame. From the Bible, I learned which is verified by the discovery of the Aztec clock that time was measured differently before 2288 BC. Yearly cycles seemed to be 7 times longer. We measure our time by a 23½ degrees fixed axis position of our earth, which gives us a nice 12-hour clock that gives every year a solstice on the 21 st of December. We have no idea what it meant for Noah’s family of 8 people to survive an asteroid impact and then notice that their calendar no longer worked. To tell their children born after and future generations about life before the Flood without books to pass on of any collective knowledge humanity previously stored in many libraries would be difficult. All had been totally lost except for what was on the ark. Knowledge now depended on what a shipbuilding family remembered. On top that, soon afterwards the one human language was divided into many at a place called Babel, which means confusion. Right away it stopped a large building project while feuding which each other for lack of understanding what they said to each other. The rest of that history you can read in Genesis. Indirectly, the Bible gives us some details how they managed to tell time, which pointed to that years behaved differently after the asteroid impact. Looking around museums we can find many examples like Mexico’s City outdoor museum with five pyramids on top of each other and buried next was found a huge 20-ton stone Aztec calendar clock. Other places like outdoor monument astronomical building complex in India or Stonehenge circle in England’s with two rows of thirteen pillars and of course many Bronze and pure Gold clocks around the globe not deciphered. I noticed during my investigation they connected with a spin-axis phenomenon of different monthly progressions, some period of solstice years were shorter, and there are periods were no spin-axis movement existed at all and even restarting the sky star picture backwards making recording of calendar changes impossible. I then asked the question, why would the zodiac constellations’ movement disappear and reappear hundreds years later again? Eventually the people after the Flood stopped building pyramids, as the heavens seem to have run amok. The Bible testifies of one time when the sun stood still for two days on the horizon and of the sun’s shadow going backwards 10 degrees. It was very difficult for humanity to measure solstice periods. It could only managed it by inventing metal clocks with three dials. If you are a true scientist, you should always ask what could be the scientific causes when seeing the many impossible effects recorded which theologian or science have no answers or seeing three dials on mystery clocks. Many scientists are prevented of finding answers deciphering mystery clocks being educated in questionable opinions taught as facts and must just wait for someone else from outside the system to come up postulating some impossible but plausible theories. Discovering true science is fun for some as many of our famous scientists were Christians educated by outside terrestrial information. Myself as an inventor it was a new challenge to investigate Biblical theological problems connected with science. Let me sum up what you cannot find in your schoolbooks. When the asteroid hit the earth on 5 February 2287 BC, the night’s sky changed forever because the earth’s orbital path around the sun changed in some manner. The sun is either our time reference point or a starry sky with constellations. My spin-axis hypothesis indicates that it was not so in ancient times; consequently, the ancients built three-dial clocks to track an active three axis spin-wobble of our earth. To encipher ancient two or three dial clocks like the Antikythera clock in Greek Anthem museum can only be explained with a three spin-axis hypothesis. The clocks in museums continually will remain mysteries unless we accept that there was a dramatic change in the earth’s movement around the sun that gradually settled down to the present situation after the passage of many hundreds of years. The Bible has imbedded information of a pre-Flood time, which is substantiated in geology with accompanying climate changes. Thanks to a friar in the 16th century collecting information in Mexico of the Aztec clock shows cycles, which do not match our global calendar now, but made sense applying it to pre-Flood situation. The Aztec calendar has a long and short count system imbedded in it that many scholars have tried to explain. I look at other evidences like mystery clocks and calculators to find clues to the answers. I also reexamined traditional dating methods published in museum books. New theories gain credence when they provide better explanations. My spin-axis hypothesis does just that. If we use our measuring techniques to calculate a 12-month for one-year duration or present system of marking time, and compare it to a Aztec calendar system from right after the Flood, the year seemed to be only about 4 months long. There were 4 months between winter solstices. That length of time was also indicated in the Aztecs’ records of nightly observations of the stars, including 24 zodiac houses or constellations. After 350 years from the Flood, Noah and his children saw many more stars than today. What they saw reached well below the equator, being caused by a rotating sky wobble of about 94 degrees (2x47 = 94), which still rotated with almost two leftover pre-Flood spin-axis turns that sometimes went opposite the direction of day count in a year [2.82]. Remember, prior to 2288 BC half the time the sun goes up from the East and then reverts half the time to rising in the West in each spin cycle according to the Aztec clock calendar horizontal spin explained later. Depending at what cycle the asteroid impacted, that spin direction would be carried over in the age after the Flood and keep spinning in that direction for awhile until it stopped rotating to merge into a Y-axis. To us that would be like looking up at a Northern sky that turned backwards two times around an axis plus so many months within one 365-day count for a year. This phenomena show up in the Bible’s longer ages for some people like Abraham 175, Isaac 180 and the prophet Ezekiel 135 years old because the calendars were still counted from solstice to solstice according to the old fashioned, pre-Flood, Aztec calendar preserved 52-day count. If you had 2 winter solstices within the earth’s 365-day “year” around the sun, you would count two very short “years” of about 180 days each due to the appearance of two real solstices due to the opposing movements of the residual wobble. The Aztecs previously counted solstice spins of 52-day cycles not knowing that after Flood the new earth wobble changed everything. They did not notice right away that the previous spin of the earth has diminished from 7 to 2 solstices during one grand, 365-day orbit around the sun. That is why they built five pyramids, one on top of the other in Mexico City. However, if you divide Abraham’s recorded age into the leftover spin-axis positions (7/847 = x/175) as plotted on my spin-axis graph (x = 1.44627), the answer provides a corrected Gregorian calendar equivalent age that is not over 120 years. This is the case for all of the seemingly too old ages. To recap, after 2287 BC people’s recorded ages start out in excess of 120 years, but the excess diminishes directly proportionate to the slowing of the residual spin left over from the asteroid impact. This process is plotted on the graph, which gives calibration factors that permit us to calculate the recorded ages into Gregorian years. As history approaches the present, no one’s recorded age exceeds 120 Gregorian years because the wobble is stabilizing towards the earth’s present axis of rotation. Similarly, the correction factor becomes become exponentially smaller until it merges into the present system. If we divide Abraham’s age by the spin-axis graph conversion factor, we get 120 years for Abraham’s true age (175/1.44627 = 121). So God’s decision to limit human life to 120 Gregorian calendar years is not violated. The ancients kept their calendars by accurate observations on what they saw in the sky. Also, my spin-axis graph is roughly worked out by hand so Abraham really lived less than 121 Gregorian years. The spin-axis hypothesis postulates after Moses time that previous 24 zodiac constellation seen on the horizon seem to slow down and eventually will disappear over many centuries and getting fewer in count like 18, 17, 16, 15, 14, 13 and then stopped altogether at 12 star constellation. As the wobble is reduced, the night sky vision is also reduced, and the ancients had to pick Zodiac stars a little higher up from a changing horizon in the starry night circle. It ended about 47 degrees and the original 24 constellations around the horizon periphery became 12 as the wobble moved to half of what it was to within one 365-day count. There was a time when the constellations seemed to be resting for 90 years and unexplainably stopped, no longer moving. Again, the X-Y spin-axis hypothesis postulates that the backward spin slowed down to equal the velocity around the 365-day earth orbit and cancelled out. Therefore, no movement could be seen viewing the sky. Historically, I noticed that there is a void in counting methods past Moses’ time causing much disunity in scientific circles in dating Egyptian dynasties, which differ by 250 years. Our theological calendar projections stated in most reference Bibles do not go beyond Moses’ time at all. Why? However, the Bible records an interesting event with a sun standing still on the horizon, expanding a sunset to 36 hours caused by an accommodating violent earthquake, which in my book redistributed the earth’s inner mass to a final spin-axis movements going forward to earth’s present axis of daily rotation. Contrast it to a previous pre-Flood cycles as revealed by the old Mayan-Aztec calendar that measured four quadrant cycles, but now seems to have only two quadrants in a year and not seven times? My spin-axis hypothesis solves these problems and demonstrates the previous quadrants as understood by the ancients. As a model, my hypothesis works. The night sky was fixed with no constellation movement at all, and this really got the Aztecs upset and confused. That is why they stopped building one pyramid to erect another on top of it: they needed to correct the orientation of the structure to the changed calendar calculations required by what they saw in the sky at that time. The constellations changed, and the priests sacrificed a thousand victims to their 20 gods. This happened five times because the stars moved. At times, the sky seemed to rotate backwards. As they observed their reference constellations, they increased the zodiac houses gradually from 1, 2, 3, 4, 5, 6, 7.....12 during Grand Solstice Cycle equivalent to an earth orbit of 365 days. It stopped once more, like previous 12 Zodiac constellations, but now going backwards from their observation in another spin direction called precession of the equinoxes which was recorded by a Spanish friar in the 15 th century. Only this new spin-axis hypothesis can give us an explanation of an Aztec calendar before the Flood time. You may go back to my spin-axis bicycle example or hold a paper globe in your hand and let it wobble in your hands, if you did not follow my train. To understand what happened when the earth rotates horizontal, let’s check it out with science. NASA tells me that our planetary solar system is located at the ideal spot in our galaxy to see stars. The earth is positioned underneath our connecting spirals and from here we have a fantastic view in the night sky above. If our globe and sun would be positioned a little inside the Milky Way, we could not see anything like being in a fog of dense debris and hydrogen clouds. However, if we imagine the earth globe with a horizontal spin-axis and on the shadow side facing away from the sun while we looked up in the sky, we would see different cycles of a night sky with stars. The visible stars would disappear alternately viewing the stars and then nothing because our earth spin rotated horizontally like one time seeing underneath our starry galaxy and at other times as the earth rotates seeing empty space below the galaxy no stars. Recent astrology postulated that our universe is arranged like a wavy carpet with nothing above or under. Observing a night sky before the flood disappearing and appearing like moon cycles became the Aztec four cycles we see imbedded in their clock. So if our earth is below on the edge of that carpet universe then the quadrants expressed in Aztec stone calendars are not necessary winter-summer four seasons like we have, but night vision cycles seeing the star-carpet or not regulated by a seven spins. Understanding Aztec clocks later will now make perfect sense to me as we continue explaining an unknown spin-axis later more completely. Repeating it again for clarification, after 2287 BC came a time when the sky was totally different and continued to change, as witnessed by what the Aztecs recorded. After the Flood, the cycles seem to get smaller until they stopped altogether. At that point, the same stars no longer moved in the sky and stood in the same location. The ancients must have understood the principle of the spin-axis hypothesis and stopped building anymore pyramids to measure time for solstice positions. It was useless to spend any more money for observation towers when the constellations stopped moving and the monthly progression could only be obtained by using moon cycles as the Hebrew calendar did. They could not even measure quadrants cycles any more. Then hundreds of years later, sky began to move again, rotating like previous monthly cycle changing into 2,3,4,5, but going in another direction and finally stopping at 12 zodiacs dividing the sky circle. To explain what happened in the sky, the Aztecs told the Spanish friar who collected it from the survivors left over from 100 million people killed by genocide ordered by a Pope in Rome to collect the gold accumulated in thousand years of Bronze Age civilizations stored in pyramids, temples and palaces. Not blaming the pope for all the massive deaths among natives, which was mostly caused by diseases the white men brought along as they looted and burned thousands of cities and communities. The horrible crimes perpetrated by the Vatican are not covered in as much detail as they should in your history books. Now we come to a period where the new sky movements of an emerging calendar needed to be explained, which the ancients tried to do with mystery clocks not deciphered in our museums. As civilization became more sophisticated and invented metal once more, we find their inventions in form of calendar bronze disks and mystery bronze clocks with unfamiliar designs not matching our clocks. So I asked like so many scientists, what do they measure? I also wondered how was it genetically possible for Methuselah to live 969 years as stated in the Bible. That led to more checking out other information that ended up in this X-Y axis hypothesis. It answers a lot of question in history, geology and science and seems very logical, which is a requirement for me as an inventor. My faith has never interfered with my scientific discoveries. Rather, it has helped me to do better science than most of my colleagues. Looking through the lens of university approved books, I did learn (to my surprise) that a scientist has mentioned a spin-axis embedded in Aztec calendars, which is valid even today. But that spin-axis takes place in accordance with what is termed the Mayan-Toltec Count of 25,625.862 years as one cycle, so my assertion that the calendars evidence a spin-axis is very scientific. The only difference is that what takes almost 26,000 years today took much less time in antiquity. Today’s long cycle is the very, very small wobble left over from the asteroid strike at the Flood. Right after the Flood, the axis of the earth moved rapidly through the precession pointing its tip through the same constellations but within the length of a human life or later, a couple generations, which is why the ancients could observe and record such a long (today) cycle that requires advanced instrumentation and computers to measure and plot. Ancient drawings show five star constellations in the night sky pointing to where our 23½-degree axis of our earth points. Today’s cosmic wobble of one turn takes about 26,000 years. It moves through stars currently named Polaris, Alderabim, Vega, Tau Herculis, and Thuban. That spin-axis is infinitely very slow compared to a life cycle of mortal person at 25,625.862 years. Later, I raise the question of global warming and reduce this earth wobble of 26,000 years to 400 years as there are two invisible axes embedded in parallel and one could twist. That immediately raises objections with a lot of scientists who would rather believe data from an obscure Aztec religion calendar than investigate a Bible, which also mentioned a spin-axis movement caused by an asteroid in Noah’s time. A one Gregorian day in 400-year cycle adjustment believed to be at rest could be due to an x-axis twist causing global weather changes that fluctuate between very cold cycles to very hot. This could explain our global warming cycles, as I will give details with more facts later. It is possible that science never noticed it, and I am sure failed to measure it. I am only raising an opinion cross-referenced with ancient cultures not considered relevant to most modern scientists. The great 25,625.862-year wobble of the earth’s rotation as it orbits around the sun was called in the Aztec Mayan culture the “Great Year” or Teoxiuhitl. The Egyptian and Sumerians knew about the northern sky path wobble traverse that is now 72º - 360º (AD 2000). The Greek Bronze Antikythera mechanism, has 2006 written on its base plate and could therefore be connected with this date, which then tells me that the designer of that clock knew about the Aztec calendar 26,000-year axis that their clock was based upon. Therefore, when we reason and allegedly observe a stationary rotation tilt of 23½ degrees and notice that there is still movement measured over thousands of years, then my hypothesis of dating the cause of that motion is in line with logic. A cause always leads to an effect as we define natural laws scientifically. We are only augmenting a time frame by looking at the evidence in geology and ancient records or eyewitness describing asteroid impact events, which could have caused the earth to spin differently. The dated spin-axis hypothesis rejected by science is in my favor postulating dates of 2288 BC. The Aztec and Mayan culture all emerged after the asteroid impact and therefore their knowledge about changing calendar cycles and spin-axis movements were developed after that. On the other hand, science seems to be grossly in error dating geological cycles due to their theory of evolution which was never proven. Repeating a theory a thousand times does not make it factual most scientists have forgotten as they have not found any proof yet after 150 years not even one. When I compare a date given by scientist of the beginning of Mexico City allegedly founded by Tenoch in AD 1323, I have a big problem with its logic. When I describe what I saw on my visit to Mexico City, you see some big mistakes in most of the books sold in the tourist stores. When you look at the sky constellations of this long cycle earth wobble, it goes backwards compared to a kitchen clock. Remember, they are not Gregorian calendar projections for those five stars between Tau Herculis and Vega are dated 15,000 BC. My spin-axis hypothesis teaches that we must divide before 2288 BC dates into (7) seven periods. This would correct it to our Gregorian calendar and connect with the Aztec calendar cycles scientists not familiar with. In other words, do not mix up and make it into rubber band calendar data theologians are famous for using when they interpret the Bible. It is like comparing oranges with apples. Secular scientists do the same thing when they ignore ancient data coming from the Bible and always expand a timeframe to make their unproven evolution billion-year theory look plausible. So, when we read about 3114 BC as the Mayan “Beginning of Time” it should be projected from a Gregorian calendar count and must be converted from the Aztec cycles to get real cosmic years that we are familiar with. If you want to be accurate, then we must enter the asteroid spin-axis event as measured from 2288 BC, which would change any calendar counting system. Let’s have another look at the religious Aztec calendar construction the monks in the 1500 AD verbally extracted from the Aztec peasants’ priest to prove my point. The scholar says that the Aztec–Mayan axis measured from Polaris at AD 2000 for a 72-degree cycle for every 5,125 years five times. The sky projection focuses on the North star-Polaris, which was different 500 years ago in the 1500s. Going backwards in time we will have Tau Herculis. Tau comes also from the Hebrew and means 400 the last letter of the Alphabet. In Hebrew, it means the end of a dimension or cycle. The Bible starts with the Waw dimension for the creation of humanity and the spin-axis retranslated from our calendar counting is 4488 BC situated between Thuban and Tau-Herculis. Consequently they agree with the Aztec and Gregorian counting system with Taw a new beginning. When we deduct AD 2012 the Aztec cycle end (Polaris), we come to 3114 BC Thuban star (5125-2012 = 3114 BC) that starts the Aztec calendar count. However, we have learned that an Asteroid destroyed that previous calendar count before the Flood, and we must therefore adjust the calendar earlier before 2288 BC. So 5,125 Aztec years minus 4,300 Gregorian years is 826 Aztec years leftover (AD 2012 + 2288 BC = 4300) [5125-4300 = 825]. Converting to Gregorian years, the difference of 825 years divided by 7 (X-axis) and we get 118 Gregorian years (825/7=118). Now added to the 4,300 plus 118 years we get a total of 4,418 years (4300+118 = 4418) Gregorian adjusted to be equal for a total complete 5,125 Aztec years cycle which equals 72 degrees. There are five star constellations for one spin-axis movement (25,625.862-year great cycle), which is where we get the 5,125 year count from. If we reason a spin-axis change and use knowledge from the Aztec-Mayan report as recorded by the Spanish monks, then we should think about another timeframe before the asteroid 2288 BC event within those five star constellations. I would insert my spin-axis hypothesis and exchange the Aztec cycles with Hebrew clock cycles, which are more accurate because they include the asteroid event. Consequently 6,500 Gregorian Hebrew clock cycles (4488 BC+AD 2012 = 6500) should be 72 degrees from Polaris to Thuban as the Hebrew cycles included the asteroid event found in the Bible converted to Gregorian years. From AD 2012 to the exact Polaris closest to the earth estimated is AD 2000 as the picture shows. Some scientist postulated a long count difference of a 145-year slack that could be smaller than AD 2012. If we take the slack of 145 years and convert them into an X-axis spin correction, than we will have 29 Gregorian years (145/7 = 29). I cannot verify modern scientific data, but using the converted 29 slack years distributed over of 26,000 years and deducting it from the Polaris date of AD 2000 as the picture shows, we get to AD 1971 (AD 2000-29 = 1971) for a 72 degree and fraction, which makes me crazy as my 10 dollar calculator just quits. So I need to add one more year if you read my previous footnote, which comes to AD 1972. Thus, from AD 2012 minus 1972 = 40 years is the difference of slack, or 29 adjusted slack plus 12 = 41 (AD 2012 - AD 2000 = 12) minus one year for BC/AD conversion equals 40. The previously adjusted Aztec years 4418 now converted to Gregorian years which gets a little smaller by 40 years slack=4378 (4,418-40 = 4,378) as some scientists say that there could be 145 years slack correction, which we converted. Now let’s find the section within the 72 degrees that belongs on the other side of the asteroid impact. (72/6,500 x 4,378 = 48.5) which is 48.5 degree. Check again the number 4,378 in the above equation (4,300+118-40 = 4,378). Now we use one Hebrew cycle of 72 degrees minus 48.5 = 23½ we arrive to our present degrees of spin-axis (72-48.5 = 23.5), which proves our spin-axis hypothesis as being very accurately calculated from the Hebrew overlay converting from Aztec-Mayan data. The previous spin when we started counting Hebrew time base 4488 BC was disturbed and counting back in time from Tau Herculis/ Thuban to the Polaris position AD 2000, which is a 72-degree angle cut short by 48½ degrees due to an asteroid. This leaves a remainder of 23½ degrees using the Gregorian conversion factor. I am trying to educate my reader to glance through all of this material from a different perspective and not take what scholars say as absolute truth – especially when distorted by their terribly biased evolutionary million year calendar cycles. Scholars should realize the unfinished Aztec pyramids found in Mexico City are, like our scientific calendars theories, also unfinished. As proof, we will visit the many mystery clocks still awaiting good explanations of how and why they measured ancient time that does not match with our modern calendars. Before we go into dating and analyzing the spin cycle hypothesis in the next chapter, I like to mention a good project for a mathematics professor. We know the weight of the earth and its velocity as well as its direction of spin. We also know that the earth was slowed down 5.24 days as the ancient calendars indicate that the earth once took only 360 days to complete its orbit around the sun. Not surprisingly, energy has been lost due to mass transferred. Understanding again we see the same .0143 fraction number we just talked about (5.24/365.24=0.0143) for an X-axis and estimating various positions to cause an axis change we can quickly conclude that there exist very few places on earth which could influence a tilt axis change if the earth was spinning horizontally. From this very limited impact possibility a crater on earth could be found and we can calculate the asteroid mass and speed at impact. This will lead us to find out the size of that first asteroid when the first civilization vanished. Of course, evolution people are not happy unless they see quoted 65 million years. They estimated that the asteroid was 6 miles wide and a 110 miles impact crater buried in water and caused the dinosaurs and 75% of all species to become extinct in the phony invented Cretaceous Period to impress you with their intelligence. Noah’s ark does however fit in this story only a little more recent. Calculating the impact energy then think along the line if you would stop the earth rotation for a while and watch the loose continent earth mass on top of a very hard surface sliding and buckle up. I will explain later a German scientist explaining those two layers like an egg covering the earth with two layers one very soft on top compared to one underlying very hard. We can than visualize the impact area as we do see a folding - buckling up occurrence creating a global continued mountain range from South America crossing over to the Rocky Mountain in the USA and in the middle a huge crater filled with water which shows from space a deeper groove about 30 degree from Equator Cordiant. Since we have an angular impact, I guess it affected globally like the European Alps moving toward the polar region. This would all be consistent with my model. Let’s have some fun reading strange concepts and at the end you monorail experts who dislike the Hebrew-Christian religion can pick up some stones and write to the Reader’s Forum your opinion. There is so many “whys” to answer, and I hope to hear a better idea. I attempted to have an explanation, but it takes both rails to have a balanced understanding. Let me sum up an issue where evolution science is pitted against the Bible. In Don Hernon Cortes’ time of AD 1519, it will have devastating consequences for human and political failures as we could have learned from the past. Our leaders have twisted the constitution to achieve their aim of greed like former popes and following the same path of self-destruction massaged with lies, which they believe would be an exception of what the history of humanity teaches and failed to analyze the demise of many civilizations on earth. Only ignorant fools would deny ancient history as we are now become witness of a global destruction of gigantic proportion which possibilities could kill billions of people as knowledge controlled by greed outstrips controlling it. Watch therefore God’s answer imbedded in clock cycle I discovered “AD 2012” which is 21 Aztec year-months cycles to go. Check out the Chinese-Aztec-Hebrew Calendar clock cycles to find out WHY! Several biblical documents written before the Flood are included at the beginning of Moses’ Genesis. These incredible eyewitnesses of the pre-Flood world describe a climate change and civilization very different from what we see around us today. Some of these mysteries may be scientifically explained because of an inventor’s recent discovery that the conservative structure of the ancient Mesoamerican calendars (Mayan-Aztec) numeric subdivisions or cycles preserves mathematical clues to the earth’s ancient pattern of rotation around the sun. These ancient Mesoamerican calendars reveal that the earth once spun on a double axis during its 365-day journey around the sun. This double axis wobble inversed the ancients’ marking of calendar time: instead of today’s 52 weeks for one year around the sun, they recorded 7 cycle-years of 52 days for every orbit of the earth around the sun. That is why the Bible records the age of many ancient people to be hundreds of years old, when they really were only centenarians plus. For example, Genesis gives Methuselah’s a genetically impossible age of 969 years, but those “years” were only 52-day-long Aztec years still counting solstice observable cycles. How can that be possible? In our modern years, Methuselah would have died at the age of 138.4, which scientifically I have no trouble accepting considering that he was the oldest man recorded and a different climate existed before the flood. The Bible reveals the genealogy of Jesus Christ in groups of 14 Aztec clock cycles as recorded by Matthew. Many more discoveries of geological, historical facts will be looked at in this book never scientifically explained and I let the reader make their own conclusion about them. The spiritual world connects with the physical world. Both exist but can only be proven when overlaid side by side like my analogy of a dual track railroad. They only make logical sense as a system observing both rails. A monorail observation perspective is not balanced. Many Scientists and Theologians therefore should validate each other’s opinions toward a common understanding of the world around us. Steel, Duncan, Marking Time, the Epic Quest to Invent the Perfect Calendar. John Wiley & sons, 2000. See chapter 22 and especially page 352. Headlines: Shine on you Crazy Internet, by Jebediah Reed, Popular Science, March 2007. Explained in Figure A, found in chapter 3. Measured back from 2287 BC [1722 BC]. Between 2.82 and 1.31 as shown in Figure A, chapter 3. The Aztec Calendar Handbook, by Randall C. Jimenez, Richard B. Graeber, Historic Science Publishing Saratoga, Ca. 95070, www.AztecCalendar.info. Hebrew calendar dates are better explained in the book published on the Internet, Mystery of Tammuz 17. This date is inscribed on the Antikythera mechanism explained in Chapter 7, which makes this calculation very accurate. The people before BC did not know about BC-AD calendar change and hand inscribed 1974 after, which is 2 years different but can be accounted for by BC/AD crossover and counting backwards will add as one year extra. A fraction is a nightmare for the clockmaker as he must decide to add or subtract an extra tooth, which involves accuracy trade-offs. These dates do not appear random as they represent historic clock cycles. Fractions require deciding on the next number before or after and compare which one connects with some historic events. That is how prophecy becomes fact, and we can predict the future by seeing a clock pattern. Israel has a historic date of 1972, and we should find out why it fits with clock cycles.